For the past two years, we have violated most of the rules of kid party planning and hosted a big dance party/play time with lots of friends and their families for Ranger's birthday. 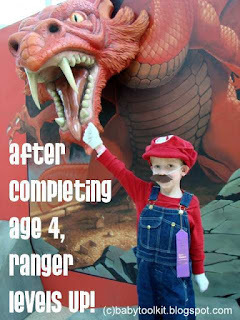 For the invitations we wanted to use a photo of Ranger as Mario. He's still so proud of his Halloween costume (especially after GenCon), and there is one photo he especially loves of his plumber alter-ego. Jim loves the photo because Mario happens to be punching the dragon from the first D&D set he ever owned. Once the photo was in place, the invitation pretty much wrote itself. As in past years, we requested guests not bring presents. We view the party as a present in itself, and we like to enjoy friends' company without obligating them to buy something. The only hiccup we encountered was that Ranger can now read the invitations. He had two separate tantrums before I reminded him that a few special people (relatives and close adult friends) always give him gifts on the day of his party. He also gets gifts from grandparents, godparents, and parents for his birthday (which usually is not the actual day of his party). The reassurance that he would have at least one special surprise was enough to meet his desires. Jim and I busied ourselves making posterboard crowns, foam medallion name tags (like Mario Olympics), and looking for activities that work with an audience ranging from age 1 to 9. We stuck with some old standby activities like building with milk-carton building blocks then knocking the structures down with homemade beanbags (tutorial coming soon*) to coloring paper crowns to dancing to a mix of Ranger's favorite tunes from the past year (another future post). Inspired by a great event at Ranger's old preschool, Jim wanted to add balloon volleyball. We didn't locate a suitable badminton/volleyball net, and it looked like we were out of luck. My mom suggested we use a section of baby gate on the floor in place of an elevated net and that worked well with our mostly preschool crowd. We had also planned a game where every kid got a balloon and tried to see how long they could keep it off the floor without catching it. I don't recall if Jim actually started this game, but it turned into a really beautiful half an hour of really serene, but active playtime. Every kid focused on their balloon and keeping it up in the air as long as possible. Even with frenetic dance music in the background, the slow transit of the balloons offered a dreamlike quality. For me, this semi-hypnotic revelry was the best part of the whole party. I reluctantly called the kids out of the gym to make their own pizzas. This was our second year of DIY pizza making. Instead of spending hours on homemade crusts this year, we bought soft pita bread from our favorite falafel place. We gave the kids paper boats of cheese and other toppings and had an adult sauce the crusts according to each child's preference. Each pizza was on its own sheet of parchment so we wrote the creator's name on a corner and sent them in batches through the church's convection oven. When all the pizzas were done, we served them all at once so no kid worried that his pizza was lost or forgotten. For the adults we had easy prep buffet foods like lasagna and Caesar salad. Friends also pitched in some wonderful additions like a fruit tray and pasta salad. *I mistakenly thought I'd posted this tutorial YEARS ago. Once I find the photos, this one will be posted. ***Baby Toolkit is the pell-mell, helter-skelter, and harum-scarum philosophizing of Midwestern geek parents with a bent for verbosity. We are indeed Amazon affiliates, so a portion of any purchases made through our Amazon links supports our site (thank you!). Photos (c) babytoolkit.blogspot.com, 2010, all rights reserved.